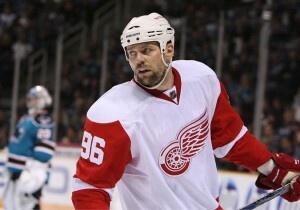 Will This Be Tomas Holmstrom’s Last Season? Since 1996 Tomas Holmstrom has donned his uniform on work nights, laced up his skates, and headed to the office. Unlike most office positions, his work has consisted of agitating, aggravating, and infuriating the competition as well as receiving all complaints, often via unconventional delivery methods such as a fist or a stick. Of course I’m not talking about a real office, this is a hockey article after-all, but as many around the league know, Homer has a very unique playing style which has earned its own nicknames. Opposing goaltenders around the league will concur that when Holmstrom takes his screening position in front of the net (his “office”) their jobs get a lot harder. One of the pioneers of this style of play, #96 is often considered the best in the game today at what he does. The Red Wings have used this talent to much success over the years, often placing Holmstrom on the top 2 lines despite his average skating and stick-handling abilities. In addition to even-strength minutes, Tomas has been a significant factor in the success of Detroit’s powerplay during his career. While he may not put up lofty point totals himself, his limiting of goalie’s vision every night helps the rest of his linemates do that part for him. Unfortunately, this style of play’s results are not all positive. In addition to the never-ending stream of goaltender interference calls that referees levee against him (wrongfully or rightfully so), Holmstrom must also endure a beating night in and night out. If there’s any indication about the effectiveness of Tomas’ style, it’s the onslaught of slashes, cross-checks, face washes, and sucker punches he receives from both goaltenders and their watchful defensemen. The abuse he faces every time he steps onto the ice understandably takes it’s toll. At 38, Holmstrom has only once in his 14 years with the Red Wings played an entire season, averaging around 70 games a year instead. Out of 492 games his team has played since the ’04-05 lockout, he has been present in just 411 (slightly more than 83%). This amount of absence is perhaps expected given the way he plays, but it isn’t easy for a body to recover from such injuries no matter how prepared for them you are. Drafted 257th overall in 1994, Tomas has tirelessly recovered from injury after injury for his entire career. Now 38, the aging forward’s body is not what it used to be, and recouparating doesn’t come as easily. Add to this the fact that Holmstrom’s contract expires at the end of this season and a Red Wings franchise that is in a period of change, and you get what looks to be the final year for the forward. This could be a deceptively big loss for the team, as his work often goes underappreciated among fans and media alike. All of this fails to mention the locker room presence that Holmstrom surely brings to the table. A veteran player with 4 Stanley Cup rings certainly offers the team’s younger generation a lot of experience and knowledge of the game. Holmstrom has passed on some of his knowledge to other members of the team while present. Franzen, Cleary, and Abdelkader seem the most ready and willing to at least partially fill the role of a crease warrior, and it’s one that will need to be filled. In a league with an ever increasing skill level, goalies have gotten better and better, and sometimes the only way to get one past a good netminder like Lundqvist or Rinne is to not allow them site of the puck. If Holmstrom does call it quits, as appears likely, it wont be a detrimental blow to the dynasty, but it will be a loss that is felt. Filling the position of this fearless veteran will be yet another challenge the ‘Wings face going forwards, and another call for someone to step up.